The London-based, Chilean-born artist Livia Marin played a central role in the transformation of sculptural practices in 1990’s Santiago. Operating in a context that was dominated by the re-working of Chilean history post-dictatorship, especially through printmaking and painting, Marin stood out for her transformation of sculptural practice. Leaving behind an arte povera influenced art scene, she created large-scale installations suggestive of American minimalist practices and process-oriented art. Very aware of her Latin American condition, she explored the nature of the image by using ephemeral materials that were lifted from everyday life such as plastic soda cups, discarded lipsticks, among others. Livia Marin’s second exhibition at House of Propellers brings together aspects of painting, photography, ceramic, textile, and sculpture. Under the formal rule of Nature Morte, the French term for Still Life, Marin appropriates this genre historically relegated to secondary spaces, supposedly lacking in greatness and scarcely ever displayed in the big salons. When we think of the Still Life as a work for interpretation, we see how Marin employs the genre by using its shortcomings, its ostensibly marginality, and its modest anonymity. The work becomes an exercise in precariousness and its possibilities, as well as an allegory for the Latin American contingency. 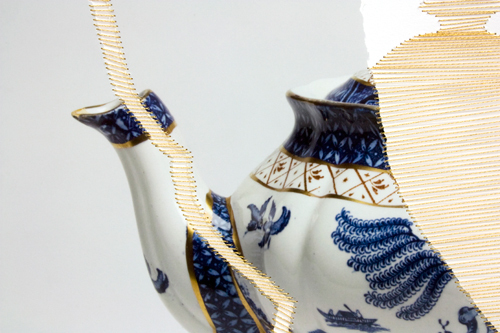 For Livia Marin to explore the composition of the Still Life is to think about the hierarchy of objects: both their spatial, social and political orders. And also to give a place to all that is forgotten and cast aside in aesthetic practice. The stitching technique applied to the photographs is related to a system of restoration and repair. In a contemporary culture of simultaneously buying and binning, these objects are a powerful reminder that no part of material culture can escape the ideological connotations of value. Livia Marin (b. in 1973) lives and works in London. Trained as a sculptor, Marin earned her MFA from Universidad de Chile. She is currently completing her PhD in Art at Goldsmith College, University of London. Recent exhibitions include “Broken Things”, House of Propellers, “El lugar de lo invisible”, Sala Gasco, Santiago, Chile; “Manuf®actured: The Conspicuous Transformation of Everyday Objects”, Museum of Contemporary Craft, Portland, Oregon, USA (2009); “Poetics of the Handmade”, The Museum of Contemporary Art (MOCA), Los Angeles, USA, “Maximinimalist”, Institute of Visual Arts (Inova), Milwaukee, USA (2007); “Multiplication”. Museum of Contemporary Art, Santiago, Chile (2006); “IV Bienal MERCOSUR”, Puerto Alegre, Brasil (2003). Marin was nominated on five occasions to the National Fund for the Arts and Culture (FONDART), Government of Chile.